Christensen set for Chelsea exit? 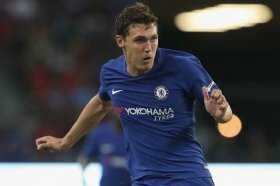 Denmark international Andreas Christensen could pursue a fresh challenge away from Chelsea this month with both Juventus and Borussia Dortmund preparing bids for his signature. The centre-back has barely featured in the Premier League this campaign and he has been restricted to the solitary start under head coach Maurizio Sarri. Due to this, there has been extended speculation linking him with a move elsewhere and The Sun claims that the Dane could head through the exit door before the transfer deadline. Juventus are currently eyeing defensive cover with the recent departure of Mehdi Benatia to Qatari side Al-Duhail while Dortmund are likewise in the market for a centre-back to enhance their title charge. Both clubs are likely to propose an initial loan agreement for the defender and reports indicate that the Blues are prepared to accept a £6m fee for the same this month. Christensen has generally featured for the Blues in the Cup and European competitions this term where he has made 12 of the 13 appearances.